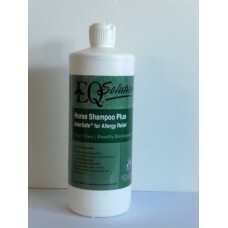 EQ® Horse Shampoo Plus AllerSafe™ for Allergy Relief 32 OZ. Horse Shampoo Plus AllerSafe contains a plant derived solution formulated from plant seed esters, non-ionic linear alcohol ethoxlate based surfactants, amine reacted tall oil fatty acids, water hardness modifier, de-ionized water, jojoba oil, and aloe vera glycerin. It DOES NOT contain: d-limonene, butyls, silica, caustics or petroleum ingredients. No dyes, fragrances or synthetics. People, Animal and Environmentally Safe.